The Fourth Frog Blog: Accidentally on purpose? My mother-in-law often tells the story of how they were on vacation when Mike was young and her turn at the wheel happened to come up as they were driving through the mountains of West Virginia. She takes great delight in recalling how my father-in-law Tom and the boys were cowering in fear when she came perilously close to the edge where the road dropped off into nothingness and how there was nowhere to pull over and change drivers for 20 miles. Whenever she tells the story, she happily reports that those were the last 20 miles she ever had to drive on a vacation. So happily, in fact, that I sometimes wonder if she eeked her way to the edge of the road a little bit (subliminally perhaps?) on purpose. She also tells how the last time she had to pick up an iron was when she scorched my father-in-law's navy whites in the early years of their now 40+ year marriage. A fortuitous accident, I wonder? Or something more deliberate? The same question came to my mind today when Charlie was in charge of vacuuming the basement carpet. Now, I know that Sunday is supposed to be a day of rest. But in our house, Saturday is more our day of rest (ok, play) and Sunday is a day of "Crap! We have a ton of work to do before we go back to work/school tomorrow." So after church today, we came home and made the assignments. Annie and Robbie were to pick up the family room, while Charlie was on basement duty. After he'd adequately picked up the clutter in the room, he was ready to vacuum. I heard the sweeper turn on and run for a few minutes. Then I heard a bit of a strangling sound and then "Mom! I need help." I ran downstairs to find that Charlie run the sweeper over a loose end of the carpet, which was quickly sucked up and wrapped around the bristle roller. 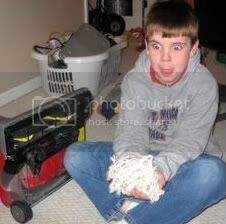 By the time I got down there, he had pulled out about three inches of fibers that had once been the carpet. After assessing the situation, I unplugged the vac and sent Charlie to fetch the scissors. Fifteen minutes later, I had freed the vacuum and had enough carpet threads to knit a sweater for the cat. As I stood the vacuum upright again, Charlie (not so) innocently asked "Should I finish sweeping, Mom, or should you do it so I don't accidentally get it jammed again?" Accidentally? I think Charlie's been talking to his grandmother. LOL! Thanks for the much-needed laugh this afternoon! I hope the carpet isn't too awfully ruined, though. Oh, and thanks for the BFF blogger award thingie. So sweet! :) I just posted halloween pictures today, so I'll try to return the BFF love sometime this week.